Mmmm!! This candle smelled good enough to eat. I smelled a buttery crust with a warm creamy pecan filling. It was very buttery and creamy. Super yum!!! 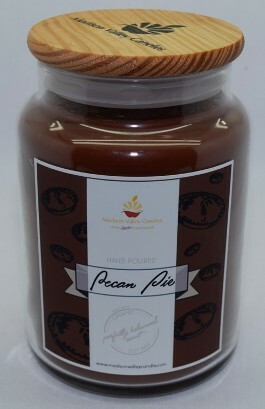 Nutty pecans blended with the delicious flavors of vanilla, brown sugar and warm spice to make a simple down-home, fresh baked treat you’re sure to love. Just smelling the wax cold, this candle is definitely vanilla first with hints of pecans and brown sugar along with what I could swear was caramel in the mix as well. Yep, I’m pretty sure I smelled caramel and a buttery one at that. So yummy! Okay, I’m tempted to eat it, a good sign we have a winner! Now let’s see how this baby performs!! Madison Valley candles are generally pretty strong for me, so I went bold and lit this candle in my master bedroom to start out. A few hours later, I ended up moving it to a medium size room. I wanted maximum scent throw and a smaller space worked best for this specific fragrance. Once moved… perfect! My entire guest bedroom smelled like a creamy vanilla, pecan custard filling with yep… hints of buttery caramel. I must say, Madison Valley’s version of Pecan Pie was really different than what I’m used to, and I say that in a good way. I’m used to a more dense pecan bakery that’s universal with pretty much every candle company out there. Not so with this one. This candle smelled creamier, lighter, fluffier – dreamier. I loved it!! Strength – this wasn’t a knockout strong scent and that’s okay. I still enjoyed it when placed in the right size room. On a scale of 1 to 10, I would rate this candle a 5 in a really large room. 7/8 in a medium size and 10 in a small room. This candle burned great. Clean burning from beginning to end. I did have to keep up with wick trimming a few times throughout the day but that’s pretty normal with burning any candle. Watch your candles people!! Trim, trim, trim! ? 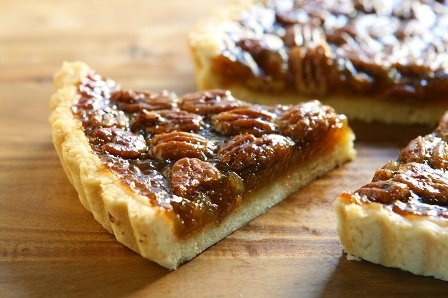 Pecan Pie from Madison Valley was a delectable bakery scent worth checking out if you love warm buttery aroma’s. I sure do, and this candle had my mouth watering the entire time I had it burning. I’ll be back for more, without a doubt. Should you give this candle a try… start out in a smaller room and go from there. Once you find the right size room, the bakery magic will commence. YUM! !